Quebec is, surprisingly, a hotbed for Australian rules football. Since 2008, AFL Quebec, formerly known as the Eastern Canadian Australian Football League, has offered players a chance to participate in the popular sport from down under. 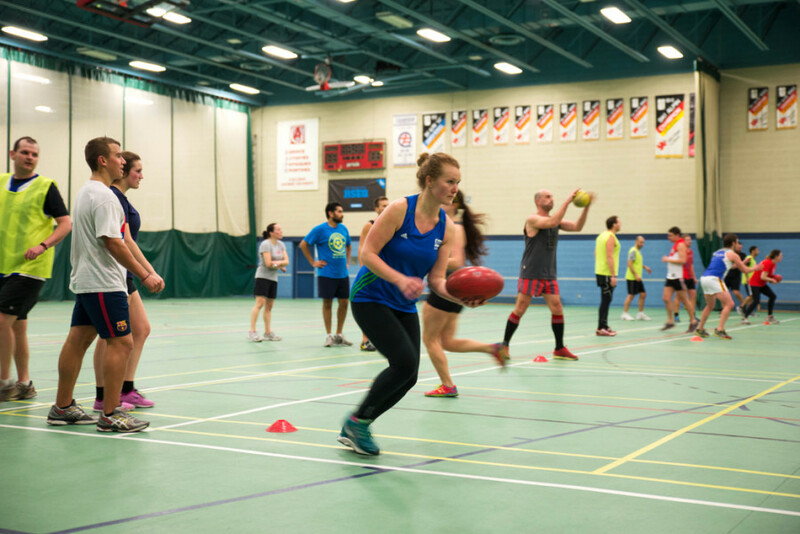 Since January, AFL Quebec has been holding open practices on Saturdays for any willing participant, regardless of skill level, of the sport. After he grew homesick of his native land, Australian Luke Anderson established the league the same year he moved to Quebec. Seven years later, Daniel Robinson, another Australian, is the current president of the AFLQ. Before moving to Canada, Robinson played two levels under the Australian Football League. He values the importance of the game, and is appreciative of Quebec’s own circuit. Coming from a soccer background, Aimee Legault is regarded as the best Australian rules footballer outside of Australia. In fact, she captained Canada to an International Cup win in August 2014 in Australia. She will also move to Australia in order to play in an upcoming professional women’s league. In Australia, the sport without offsides and timeouts features 18 players on each side of a massive oval field. The clock only stops if the ball goes out. For various reasons, the game is altered here. The unique scorekeeping is maintained with the two goal posts and two behind poles. A player who kicks the football between the former will award his team six points. An athlete who propels the ball onto a goal post or between two poles of different heights gives his team a single point, known as a behind. Therefore, the team that finishes with 8.17 has recorded eight goals and 17 behinds for a final score of 65. The AFLQ is composed of four men’s teams and only two women’s teams. In each league, all sides make the post-season and compete in a two- or four-team single-game elimination playoff until one champion is left standing. At times, the squads will merge together to form the women’s Montreal Angels and the men’s Quebec Saints, both 18-a-side teams. They will travel and compete against other teams from North America in exhibition matches or at the U.S. Nationals. Shaughnessy moved from Ireland to Montreal in 2009. For him, Australian football is the lovechild of Gaelic football and rugby. Emily Legault, who represented a second Canadian team at the Australian Football International Cup, is going into her fourth season. The Concordia student said Australian football is a full-time commitment. “Now, we practice indoors starting about mid-February until April and then we switch to outdoors on Wednesday nights,” said Christopher Micheletti, the 2011 AFLQ leading goal-kicker. Micheletti, who once played for the Concordia Stingers men’s rugby team, learned about an AFLQ team based in Pointe-Claire a few years ago. He emailed them and was told to simply show up at a practice. It has been an adventure for him ever since. Veronique Chasse has been playing for three years. She lived in Australia for a year, so she learned about the sport. In Quebec, she has been witnessing the development of both leagues. “[The sport here] is growing a lot,” said Chasse. The Ottawa Swans from AFL Ontario will be dividing into two teams, as they will join the NDG Devils and Plateau Eagles in the women’s league for 2015 onward. The men’s league is composed of the Laval Bombers, Montreal Demons, Old Montreal Dockers and West Island Wooders, and there may be more teams in the future. “We’re hoping to expand and get a team in Sherbrooke in the next year and maybe Quebec City, but we need someone up there to do that,” said Shaughnessy. Due to its obscurity, physicality and complexity, introducing people to the sport has been a struggle. As a result of a limited number of coaches, the men and women often practice together. Despite whatever barriers lie in the way of Aussie rules in Quebec, AFLQ president Robinson has big plans for the future and development of the league. “I think it’s really important that we get a junior program here in Quebec in the schools because that’s where it all comes from,” said Robinson. “If you can get young kids into the sport, they’re going to grow up continuing when they’re older.